A few days ago, as it does every year at this time, the World Bank has presented its report “Doing Business 2017 [the actual report from the World Bank reads 2018]; measuring the quality and regulatory efficiency”. This is an annual evaluation that has been done for 15 years to 190 countries on the conditions offered to those who want to invest. As it has been repeated for several years now, our country has come back very badly from the evaluation corresponding to this year and its projections towards 2018. It appears among the four economies with the worst classification in Latin America, in 152nd position, only ahead of Venezuela (188), out of a total of 190 countries evaluated. So poor are the results, they are explained, according to the report, because Bolivia fell five points in the factor “property registry”. It also worsened its qualification in “management of construction permits”, and in the category the “resolution of insolvency”, which identifies the weak points of the insolvency laws and the main procedural and administrative bottlenecks in this type of process. There was, however, some improvement in the “cross-border trade” factor. These results can not and should not go unnoticed, because the study is considered one of the most important and reliable, so it is taken by companies as one of the main references that guide their decisions when choosing destinations for their investments. For this reason, most of the governments of the world give great importance to the study and strive to put into practice the recommendations that accompany the diagnosis. For many reasons, our country would have to be one of the most anxiously awaiting the results of the study every year, because it is among those that make the most efforts to reverse a negative image that is dragged by the turbulence of the turn of the century and the wave of nationalizations with which the current government management began. 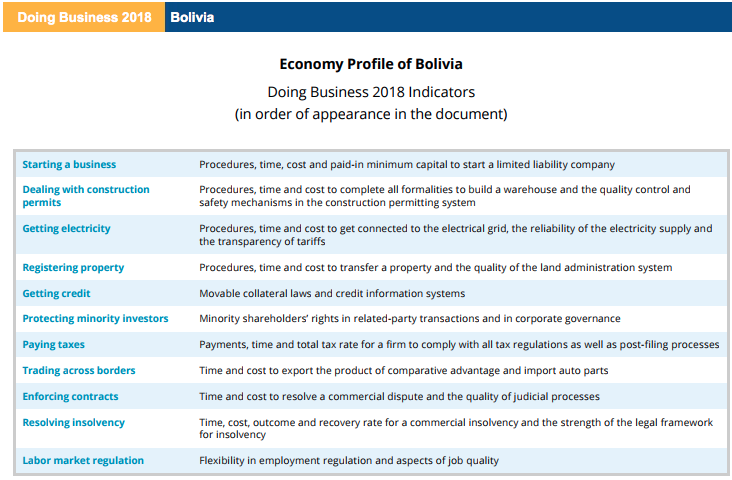 To improve this image, the authorities of the economic area spare no effort, because they are aware that a good part of our economic future depends on the efficiency with which the image of Bolivia is projected to the world as a country deserving of the confidence of the investors. With this background, the bad perception has to be received by the authorities of the economic area as an important warning signal, because the bad grades have the aggravating factor that far from revealing an unknown facet of the national reality they do nothing more than ratify a diagnosis which is repeated year after year without major changes. Bolivian Thoughts opinion: This report corroborates the total ineptitude of the coca grower caudillo’s government. We just wasted over $160 billion dollars over the last eleven years, when we experienced our best economic times ever, due to the international prices of our exports. Well, this government, despite having absolute control of ALL State powers, could have really made a significant change in our economy, which didn’t happened. Instead, anarchy rules around smuggling activities that undermine our industries. Demagogue bonuses, road blockades and export quotas have forced thousands of businesses to go bankrupt. On top of the above, blooming narcotrafficking with increasing violence nationwide, along with political persecution, corruption and freedom of the press being under siege, it is hard to recover and our democracy is in peril.